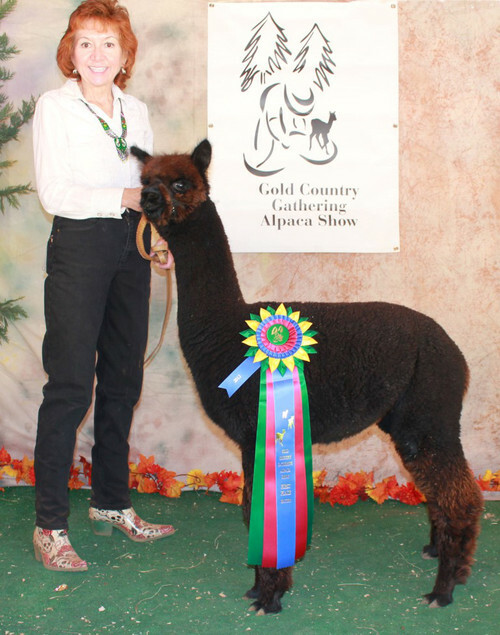 Son of the famed My Peruvian Rolex, Gallant Deed won the North American Halter competition and the AOBA fleece competition in 2003. He has an outstanding lineage, with Accoyo Augusto and Accoyo Royal Fawn in his background. 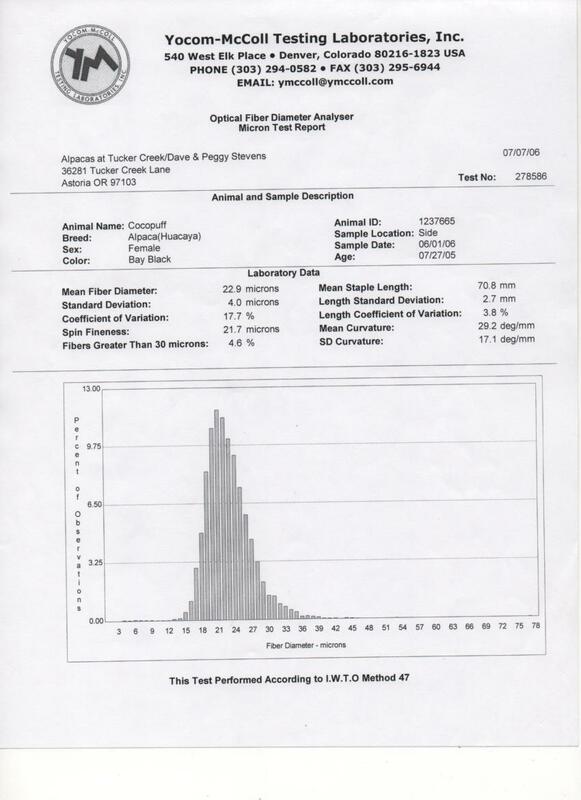 His micron count at 1 year was 16.7, and at 3 years it was 17.7 with SD of 3.8 and %> 30 microns of 0.9%!! He is drop dead gorgeous with a crimpy, bundled fleece. 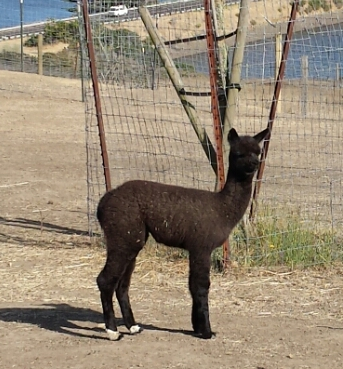 Elana is the product of the successful Studmaster breeding program affiliated with North West Alpacas. She is a good breeder and an excellent dam. 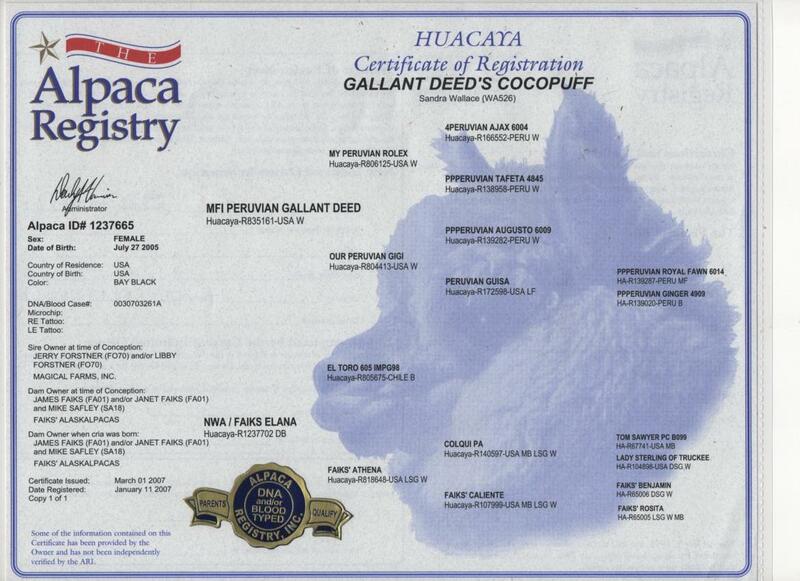 Cocopuff is the product of the acclaimed Studmaster/Ideal Alpaca Community breeding program affiliated with North West Alpacas. It's fascinating to see how her grand-dam was "improved" in her breeding to Studmaster El Toro. Then, Cocopuff's dam was improved with her breeding to the outstanding MFI Peruvian Gallant Deed, one of the top Studmaster herdsires. Cocopuff is the result, and she is a solid, true black gal with a heavy blanket. She has bred readily and had trouble-free births of her six crias. She has excellent maternal instincts. 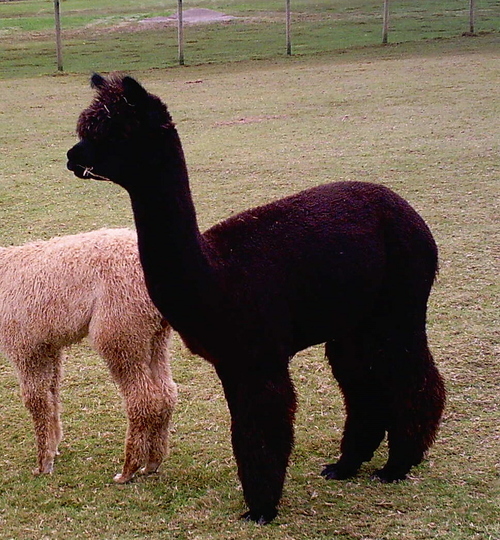 Cocopuff comes with a breeding to your choice of our 2 champion black herdsires--Dundee's AJ Stormcat (sire of 2 previous TB offspring, both of whom took competitive blue ribbons their first time in the ring), and Marin's SC Torrefacto, sire of her stiking TB female cria in 2015. 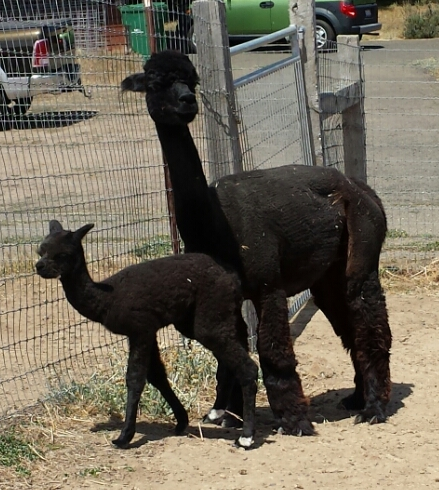 Cocopuff had her 2015 cria on June 13--an adorable TB girl with matching white "spats" on her hind feet. 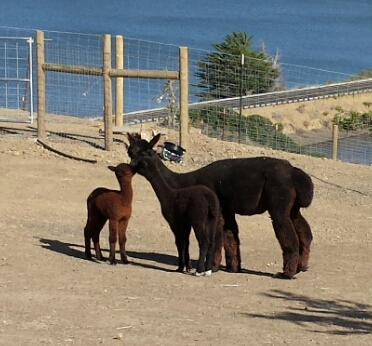 I really appreciate Cocopuff for her no-nonsense attitude--easy breeder, trouble free pregnancy, no commotion over the birth--I just looked up the hill, and there was a healthy cria kushed next to her dam, who was ready to pass the afterbirth. She's an affectionate Mom, and pretty good about letting us handle the baby. Definitely NOT a "drama queen"! We've named this cria "Moka", she is lovely--very soft handle, nice crimp, very bright fleece and perfect conformation. Moka is ready to wean and will not sell with her dam. Instead, we offer the breeding. Also, please see our "Black is Back" package that features Cocopuff plus a blue-ribbon winning black male junior herdsire, unrelated to Cocopuff(note: that would be Torrefacto). Give your black breeding program a jump start! Cocopuff has come to her new "digs" in coastal Marin County CA, in the North San Francisco Bay area.